Furla is a brand SG and savvy family always turns to for fun stylish bags. I mean as much as I like Hermes and Chanel, unless a gal has a money tree in the backyard (I don't have one but if you do, please write me to let me know where I can buy one), we do need to pick and choose what to splurge on. 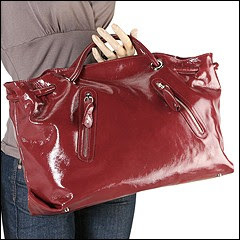 I really like Furla quality and the workmanship, yet the price is within a comfortable range, especially during a sale. I am into red recently so it's hardly a surprise I am digging this red patent leather shopper catches my eyes immediately. The silhouette is quite simple but SG likes how the handles are integrated with the bag itself. In other circumstance those 2 zippers on the front would have turned me away from the tote but I think they work well with the whole look. This bag is simple, sporty and stylish in my book. And, the price won't break my bank at $599. 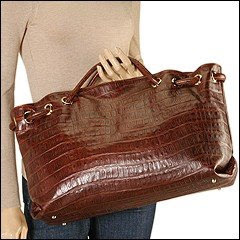 Shopper style handbag made of genuine leather. Interior lining with a back wall zip pocket and multifunctional slip pockets. The Clara is ultra-savvy! CC loves her some red patent! omg i love love them all esp the carmen one--the red patent is great too. That grey bag is cool. The texture looks great. I love the shape and texture of the grey bag. My favourite by far. I like what you like... that is a super good looking bag.